TSBroadcaster 4 is the latest version of S&T's DSM-CC carousel, MPEG encoding and streaming software. This version may be installed in a Virtual Machine environment. The selected VM hardware, software and configuration will be subject to S&T's certification. OpenCable Common Download and DTA download. A number of worldwide iTV standards such as HbbTV, ATSC, MHP, MHEG. EBIF/ETV. OCAP, or tru2way, both bound and unbound applications. MPEG-2 transport streams generated by TSBroadcaster are delivered by TSPlayer. TSBroadcaster also generates the appropriate signalling which indicates to set-top-boxes downstream of the existence of an application or code download. TSBroadcaster servers are accessed by a web browser. In addition, all aspects of TSBroadcaster's functionality can also be accessible via Java API, REST and XML. This allows easy integration with other headend software. 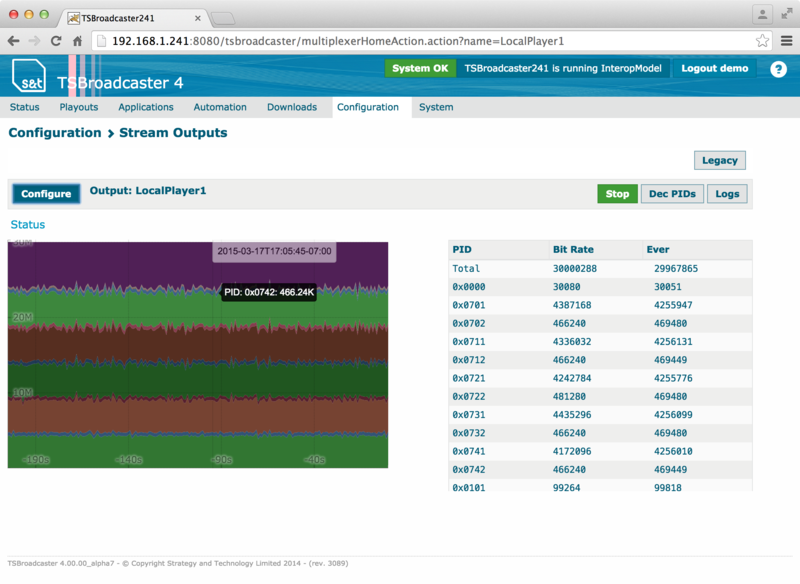 TSBroadcaster can build and play multiple transport streams simultaneously. Each output requires a separate copy of TSPlayer which typically runs on the same hardware platform as the TSBroadcaster server. We suggest a limit of four TSPlayers per hardware platform. The default TSBroadcaster configuration provides one output per TSBroadcaster system but these can be increased upon request. S&T recommend that TSBroadcaster is installed on an HP DL 360 Gen10 or similar system running CentOS 6.5. Supported in a Virtual Machine environment. Datacasting capable. Allows generation and playout of standalone data carousels. Enhanced SCTE-65 Channel Maps. Including (i) an optional unique id a channel definition (ii) max bit rate for an OOB channel map sets and (iii) generation of one SVCT DCM sub-table and one SVCT VCM per virtual channel table ID. Integration with S&T's Channel Monitoring software. This allows TSBroadcaster 4 to generate playout of EBIF and applications triggered using CEA-708 closed caption service 6 or SCTE-35 messages. Zero Install UI using native browser features (no Flash or Java applets). Creation and management of multiple carousels. Injection of ETV-EBIF and OCAP stream events (triggers). Peer groups for n+1 resiliency and automatic failover support. A variety of failover approaches are supported. Inspection of live carousels and MPEG signalling tables such as EISS, AIT and XAIT. SNMP polling and trap support.